Groundhog Day – Happy 10th Anniversary, Punxsutawney Phyllis! Today is a very special day! Yes, I know, it is Groundhog Day. And unfortunately, I believe we are in for another six weeks of winter. 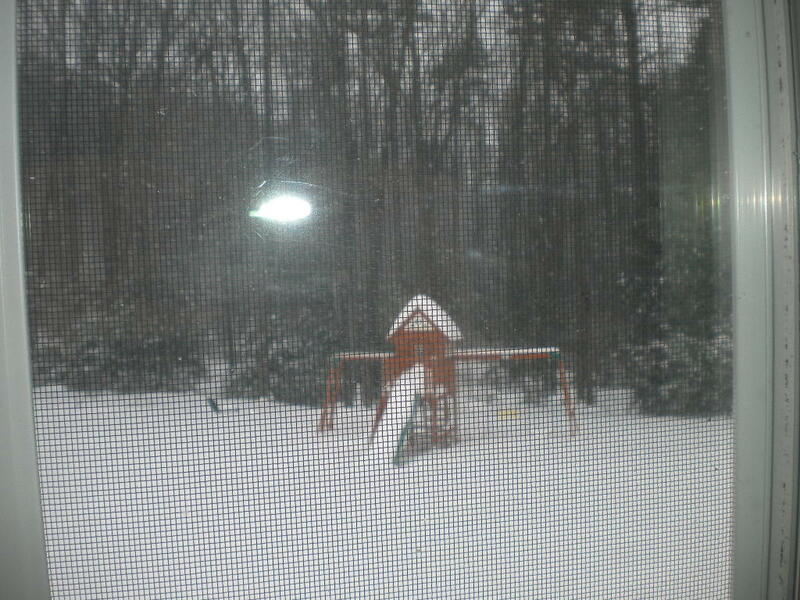 Right now, we are being hit with yet another BLIZZARD here in New Hampshire. 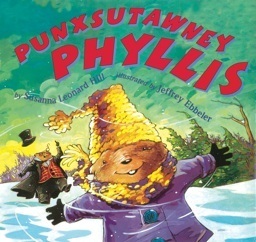 But it is also the 10th Anniversary of the publication of Punxsutawney Phyllis, Susanna Leonard Hill’s lovely picture book about a feisty girl groundhog. Susanna has created a link up party on her blog. – stop over and visit. Here is my entry for the celebration. I grabbed my robe and screamed a scream that screamers said was shrill. with some nuts and acorns – please be careful, they might spill. I hope you enjoyed my little ditty. Last year, a bunch of us participated in a fashion contest for Phyllis. 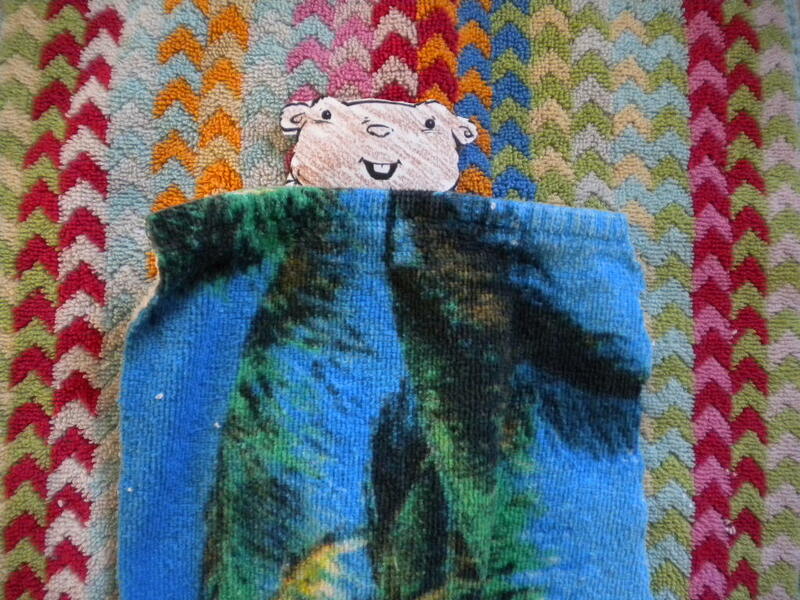 My entry featured Phyllis, relaxing on her beach blanket in sunny Mexico! Stay safe and stay warm, wherever you are! This entry was posted in Groundhog Day, Poetry, Punxsutawney Phyllis and tagged Edgar Allen Poe, Poetry, Punxsutawney Phyllis, Susanna Leonard Hill by viviankirkfield. Bookmark the permalink. This is great. Sorry you are being hit with another blizzard. We have 50s this week in Colorado Springs … We still have plenty of time for snow before spring here. Sigh. Stacy…And yet another storm is on it’s way for this weekend. 😦 And I noticed that you guys had temps in the 70’s on Friday…what’s up with that? 🙂 🙂 But you’re right…I always thought the worst snowstorms in the Springs were in March. Perfect Poe-st!!! We are expecting snow on Wednesday, but you probably don’t want to hear it will shoot back up to the 60’s by Friday. Sorry! I love all of the contests, challenges and writing prompts you cook up for us, Susanna…I need to head over to WYRI and comment..I missed this week AND last week…that’s never happened before. OMG, *claps louldy* That was fabulous, Vivian!!!! I adore it. Very creative, sweet and fun. Boy, you are getting slammed with bad weather. Bet you wish spring would come early. Poe would be proud of you, Vivian. 🙂 What a fun birthday poen for Punxsutawney Phyllis! Hope you can stay safe and warm. I sooo enjoyed your little ditty, Vivian! Great fun! Very clever, Vivian. Poet would be impressed. I can imagine Phyllis in a robe and glasses listening to this. trill, thrill, frill, spill, shrill…so many lovely rhymes. I love it! Awesome ditty!!!!! Way to go Ms Kirkfield!!! Stay warm up there! Glad you liked it, Rhythm. 🙂 And it’s nice and toasty inside!